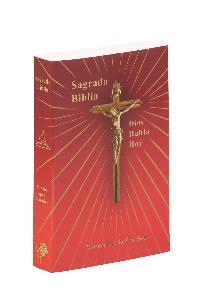 Presentation page; Scripture Readings for Our Wedding Day; Stories of Christmas (Las Historias de Navidad) and Easter (Las Historias de Pascua) will come alive for all ages in these beautifully illustrated pages. 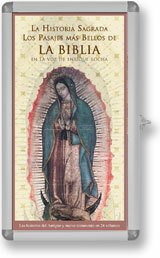 978-1-55665-705-4 Stock #7056 Size: 11"x8 1/2"x2"
Una sección para escribir sus acontecimientos familiares en papel de primera. Hermosas ilustraciones de profetas, patriarcas y otros héroes bíblicos. Your child's First Holy Communion is one of the most solemn and significant days in his or her life. 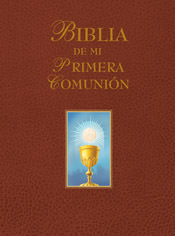 And there is no better way to mark this special occasion than with the Biblia De Mi Primera Comunión, new from Saint Benedict Press. Following Fr. Groeschel's letter, 26 Bible stories from the New Testament will help children come to know and love Jesus even more. 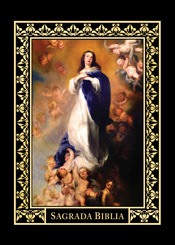 Each story is beautifully illustrated in a manner that will inspire young readers and bring the Bible stories to life. 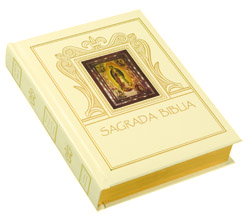 The Biblia De Mi Primera Comunión is the perfect gift for First Communicants from parents, godparents, pastors, or any special person in their life, and the perfect way to encourage children's love for the Lord, present in the Holy Eucharist.